Blog reader, Ju, surprised me with an unexpected gift; a freshly minted set of postal stamps. 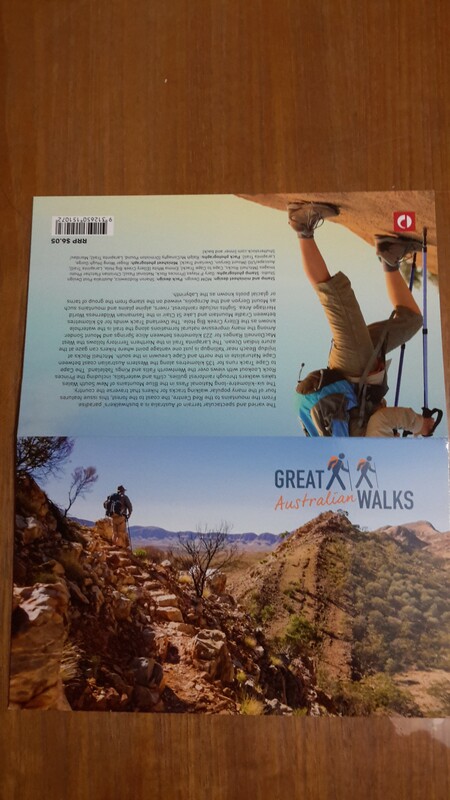 Recently Australia Post released the set noting 4 Great Australian Walks: The National Pass in New South Wales, the Cape to Cape Track in Western Australia, the Larapinta Trail in the Northern Territory, and the Overland Track in Tasmania. 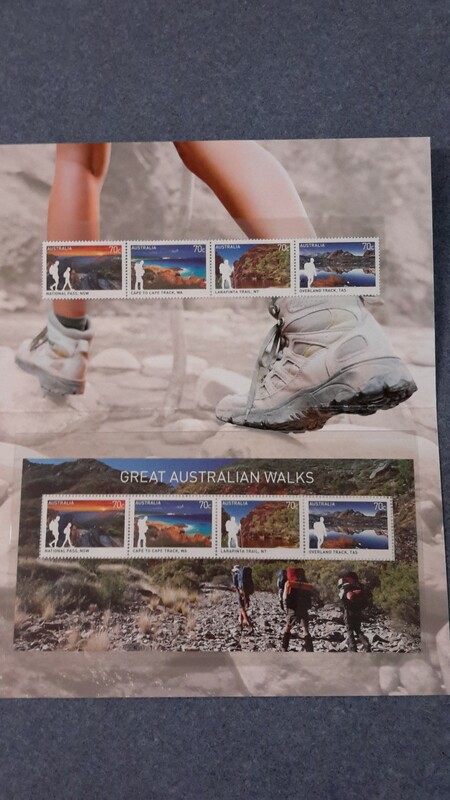 On each of the four gloriously coloured stamps, a photograph of an iconic landscape represents each Walk. On the edge of each stamp, a white featureless body with a pack-on-the-back shape represents one or more people walking. Mentally you can pop yourself into the body and become that walker. The image for Tasmania’s Overland Track is Cradle Mountain. This marks the commencement in northern Tasmania for the 60km walk which winds southwards and ends at Lake St Clair (regular blog readers know the southern end of that Lake is where the Derwent River commences its life). I walked the Overland Track in 2006 and strongly recommend it to others; leisurely – over 6 days with walks off the main path and plenty of time to soak in the atmosphere. I remember that when I saw some of the mountains on the west coast of Tasmania way in the distance, I realised Tasmania was not so large. I thought it would be possible to walk across this state from the east to the west but I have not pursued that idea. Yet. Looking across to Cradle Mountain and beyond, and at its reflection in the pristine Dove Lake at its feet, I can see a light powdering of snow. Currently, snow is very topical. Over the past few days, Hobart and the rest of Tasmania have received loads of snow the likes of which hasn’t been seen here for 30 years. 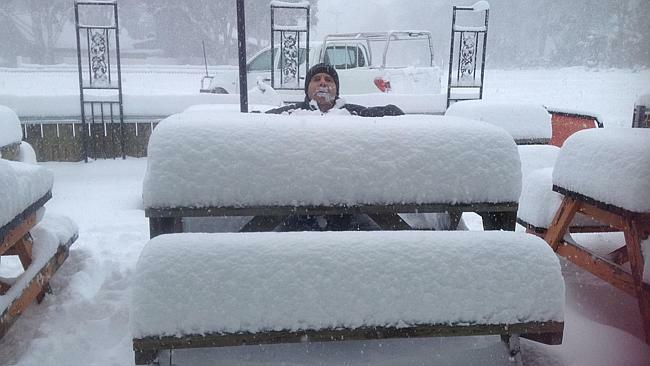 News and social media are brimming with sensational photos many showing the thrill of this unusual flurry: for example, http://www.abc.net.au/news/2015-08-03/snow-across-tasmania-forces-many-key-road-closures/6666838 and http://www.news.com.au/national/tasmania/cold-brings-warnings-and-snow-wonder/story-fnn32rbc-1227467164313. Most appropriate for this blog about Walking the Derwent, is the photo I found of The Hungry Wombat Café at Derwent Bridge (the township at the southern end of Lake St Clair to which I will walk sooner or later). When you look at the photo below (taken from the website above), you will understand why I am not walking inland at the moment. 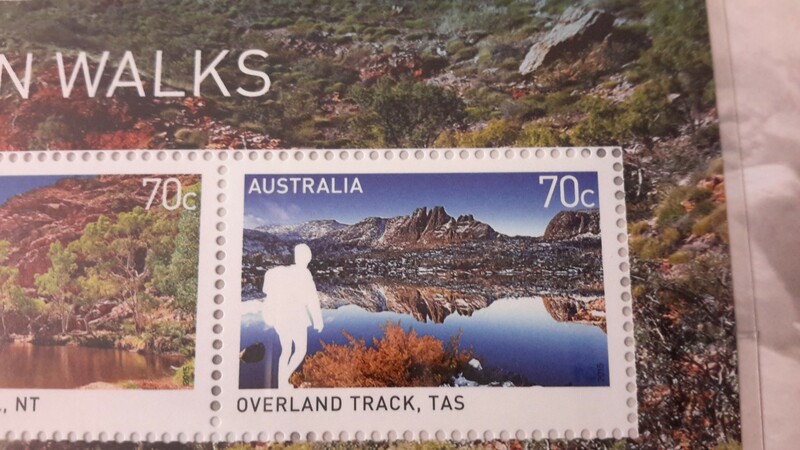 This entry was posted in Derwent River, Hobart, Tasmania, Walking and tagged Australia Post, Cape to Cape Track, Cradle Mountain, Derwent Bridge, Dove Lake, Great Australian Walks, Hobart, Lake St Clair, Larapinta Trail, New South Wales, Northern Territory, Overland Track, postal stamps, stamps, Tasmania, The Hungry Wombat Café, The National Pass, Western Australia on August 5, 2015 by Tasmanian traveller.